David Hockney, at age 76, is returning to basics. He’s drawing. Of course, being David Hockney, he’s also painting, and working with an iPad and videos. I actually believe he only says he’s “returning” to basics. I think he never left. 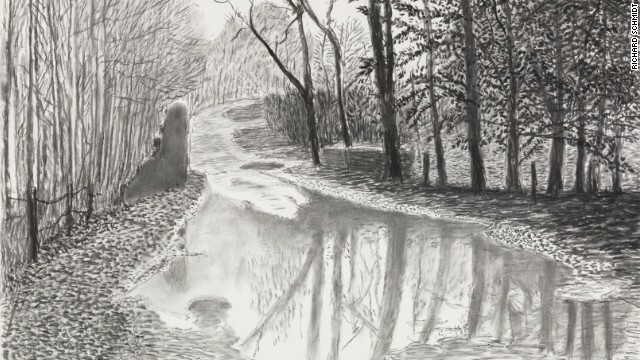 Over the years, Hockney has thought a lot about the place of drawing in the art world. He has a very broad definition of drawing: he would say that painting is not merely based on drawing, but in his world, it is drawing, albeit with a broad brush. He claims that his photography of the 1980s, where he joined Polaroid photographs without cropping to make “pictures” was drawing, as are his joined iPad drawings and his video explorations done in this century. Terry Grant and I got to see Hockney’s “A Bigger Exhibition” at San Francisco’s de Young exhibit in January 2014. I was most drawn to Hockney’s painted works; Terry was most fascinated by his digital (iPad) drawings. But because I’ve been thinking about drawing lately and have been experimenting with drawing on a digital tablet, I went back to Hockney to see what he had to say about drawing. Not surprisingly, he has a lot to say about it. I found myself thinking about his drawing theories, his tools, his processes, and the products of all that work. Hockney’s grids, which he composes of separate pieces and then bumps together in quilt-like fashion, are particularly important to his theories of drawing and seeing. 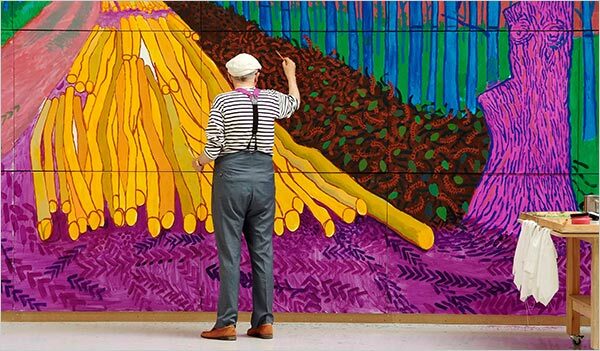 Hockney’s current preoccupation with painting, drawing, and digital art are about time and space and how they can be expressed in two-dimensional wall art. Grids, as he puts them together, can combine space and time in a way that single photographs as well as conventional single drawings and paintings cannot. Because he is thinking about “time”, he says that pictures produced over time — paintings, drawings, collage art, digital drawings, and specialized videos that he grids together — are all “pictures”, “depictions”, i.e. art. David Hockney, painting Winter Timber, about 2009, from NY Times. But when, in the 1980s, he used a Polaroid camera for his art, he found the process allowed him to explore space and time in a much more “realistic” manner. And so Hockney has always been interested in technical explorations, new tools, for making art. But he tends to play with the technology in unorthodox ways. David Hockney, Pear Blossom Highway, 11-18th April, 1986. One of his “Joins”, using innumerable Polaroid photos to collage an picture. Image taken from AIUS.com, where a full description of Hockney’s “joiners” can be found. Hockney was an early user of the iPhone for drawing, using the Brushes app, and he continues to produce art on his iPad; he also has done videos with multiple cameras mounted on a moving vehicle and presented them as a single sequential image (see this YouTube). These are all “grid” types of work. The de Young museum exhibition has been described as “the adamantly hand-rendered and the wildly technologically amplified” (Lawrence Weschler, the Smithsonian. So Hockney isn’t against mechanical tools, only against our belief that the single shot, fixed perspective camera image is realistic. The problem with the camera, says Hockney, is that it stops time, whereas our eyes and our perceptions are always moving which means we see over time. And it falsifies vision in its one-eyed focus with accompanying fuzziness, its classic perspective, and its split-second look. Cameras make us think that they capture a visual truth, but they are like any art work; artistic license is at play, and, particularly, are distorted by the tool itself. They abstract an image and call it real. Picasso, on the other hand, is not about abstraction, according to Hockney; he (Picasso) is all about seeing truthfully. And about drawing: “The feeling of things in space and how to place them in space is a drawing skill” says H. That sounds a bit general, even grandiose, but it places something he conceives of as drawing, even when it’s done entirely through Polaroid photographs or moving videos, at the center of the depicted object. So Hockney’s “Joins,” from the 1980s, are camera images but they are immersed in time because the views are done over time, with changing light conditions and by moving the camera itself, just as the artist moves her eye when she draws or paints. A drawing or painting or iPad drawing takes time to do, so it includes time. And when the drawings, paintings, iPad renderings are placed in grids, more time is included. David Hockney, Mother Bradford, Yorkshire 4th May 1982 composite Polaroid, 56 x 23 1/2 in. Hockney would claim that working with photos, as he did in his Joins and as he does in his video renditions, is “drawing”. These processes juxtapose multiple images without cropping so that the artist must bring the edges together to compose a single image, just as someone with a pencil and tablet would have to do in drawing a scene on-site. The artist’s task is to remake photos or videos or the real world, using them to make drawings, or paintings in order to produce whole pictures. H. often violates a variety of the principles and elements of design, and in doing so, makes us see anew. So, Hockney is not concerned with labeling tools as drawing tools — any medium, including the video camera, can be used to “draw”. His iPad exhibits at the de Young show his drawings as they emerge on the iPad, using the app that allows that, and producing a “picture” over time. And the videos at the de Young were made from nine cameras, filming from their mounts on a moving vehicle, then pieced together, on a moving grid that fills the entire wall. Many videos were taken on the vehicle before he got the footage he needed to compose his video painting. (Here’s the YouTube link again, of the winter scene shown at the de Young.) . When Hockney takes on a project, which may end up (if that is the right phrase) as an oil painting or a moving video with nine “canvases”, he generally starts by looking, then sketching, and painting and filming, then coming back and looking again and sketching again and filming some more. The oldest saying about drawing I’ve heard is that “drawing will teach you to see”. So drawing from photographs will teach you to see from that false, single static camera focus. You need to learn to draw by looking at the visually confused complicated real world. Moreover you must see it over time. The time might be measured in seconds (if you have a really really excellent visual memory) or, more likely, over hours or even days. But nevertheless, it will be over time. Hockney’s art work, whether we call it painting, drawing, iPad sketches, or videos, is drawn from his need to look and look again. And his explanations and discussions of his looking and looking again are of a piece with the art. One informs and enriches the other. To my eyes, what he is doing is reviving painting, reviving drawing, insisting that the newer technologies are simple extensions of the revivals of looking and seeing and making art from what we actually see. Not from what the camera has taught us to see, but what in fact we see. [For an overview of the de Young paintings and videos, see my 3-part post, beginning here].